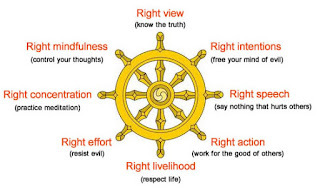 The eightfold path is Buddha’s teaching outlining the way leading to spiritual enlightenment and cessation of suffering (Smith 14). The Buddhists associate following the path to great wisdom, which helps a person eradicate delusions, hatred and greed. The first path is the called the rightful view. It means viewing the world as it is with the understanding that all things are temporary; nothing exists without dependencies and that there is no existence without suffering (Nyanatiloka 22). This understanding guides one to perceive the world without greed, delusion and hatred. Right view also explains how humans cling to the world’s views and perceive them as permanent when they are not. The second path is right intention. It explains the need for people to be mindful of their intentions with their actions and with others. When their intentions are ridden with anger, greed or resentment, the propensity of doing evil is higher than when their intentions are informed by a desire to help, understand or make the world better. Intentions should guide meditation, speaking or acting effectively. Mindfulness to intentions prior to action, writing or speaking is a learning process that takes time. It is also a practice that involves conscious setting of new intentions and replacing them with old ones (Jarnot 17). The third path is right action. The path calls for people’s mindfulness to actions and behaviors. Actions should be directed to helping and reducing suffering rather than harming. People should develop an ethical mentality, whereby they judge the outcomes of their actions whether it is harm or suffering for self and others. The fourth path is right speech, which emphasizes people’s mindfulness to the intention of their speech either talking or writing (Sangharakshita 16). They should desist from lying, hurting feelings, gossiping, using confusing language or annoying speech. These actions cause suffering to the affected people. The desire to give an opinion, criticism or correction should be guided by an examination of intentions, whether good or harm. The fifth path is right livelihood, which addresses the means through which people earn a living. People should evaluate whether the means of livelihood helps others or causes suffering. The path calls for people to assess their intentions when interacting with co-workers, job requirements and their approach to work ethics. They should desist from cheating employers or treating coworkers unfairly (Sangharakshita 27). The sixth path is right effort. The path emphasizes on putting effort to our desired accomplishments with the intention of reducing suffering. The efforts should develop compassion and ethics rather than breed fear, greed, hatred and discrimination. The seventh path is right mindfulness. The path requires that the mindfulness should help people to focus on the present to enable them interact appropriately and desist from creating and worsening problems. Mindfulness, together with proper effort and intention helps people to deal with the daily occurrences appropriately (Nyanatiloka 13). The last path is right concentration. It requires focusing the mind on one thing, excluding everything else. It thrives through meditation and requires the use of right mindfulness, right intention and right effort (Sangharakshita 19). It requires a free mind and helps people to avoid unskillful thinking. It creates thoughts that harbor wisdom. The eightfold path should be revisited, reviewed and regurgitated regularly, laying focus on the areas emphasized. The paths work harmoniously to develop each other and practicing them is a process that should continue for a lifetime. Observing the paths improves the quality of life and is highly rewarding. 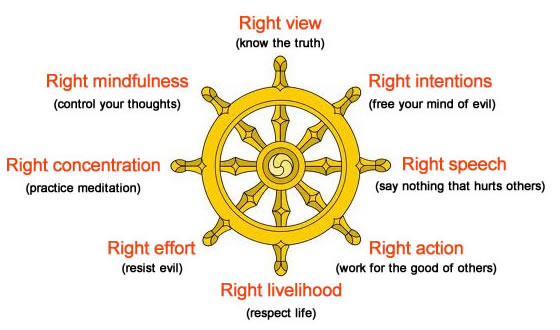 Sangharakshita, The Buddha's Noble Eightfold Path. Birmingham: Windhorse Pub, 2007.
thanks for sharing,life is not easy, live at this moment,relax urself, more useful information and fun activity on Brighton body rubs, u can find what u want，u will see ur sunshine again.